During this month, we rededicate ourselves to breaking the cycle of violence. By providing young people with education about healthy relationships, and by changing attitudes that support violence, we recognize that domestic violence can be prevented. We must build the capacity of our Nation’s victim service providers to reach and serve those in need. We urge community leaders to raise awareness and bring attention to this quiet crisis. Together, we must ensure that, in America, no victim of domestic violence ever struggles alone. Even amidst all this positivity, I’m kind of saddened. As a soon-to-be 28 year old woman (Nov 1! ), I realize that neither I nor many of my peers know how to articulate the characteristics of a healthy relationship. So few of us have seen them or been in them. If we’re honest with ourselves, we’ll see that this is a true statement. How can we be mentors and teachers to young people starting out? Start Strong’s target audience is 11-14 year old boys and girls. Good, it’s not too early. Clearly we all needed some help learning how to love ourselves and one another in a supportive, encouraging, uplifting and healthy way. I’m going to keep an eye on this organization and I hope that you do too. Try following Start Strong on Twitter. Give Start Strong your relationship feedback. They need to know what you know. Click Here to give your feedback! Post a conversation starter to your Facebook (http://tinyurl.com/yfxr7yl) or Twitter profile. This will have a major impact. Is it funny if you knew the cartoonist was Black? So remember how I was all womp womp about not being able to be in DC with all of you for the inauguration? Well, I’m still womp womp. Even more so after I had to go to bed last night knowing everyone stateside was just gearing up to watch everything (from the frigid Mall or gathered around their TV sets). I woke up around 8:30am (6:30pm est) and watched a replay of the President’s oath and speech on MSNBC. I caught up on reactions via Twitter. I flipped through blogs and I skimmed photos. While I was glad for the Obamas and proud of the historical moment we are living through, I was kind of pissed because, well, it just didn’t feel like much. Folks on Twitter were talking about their tears and the shivers up their spine. They were all on and on about the electicity in the air, even while their toes froze off of their feet. Granted, I’m not much of a crier unless I’m going through my ever-3-months breakdown and I’m still like two months away from my next due date. Then I got back on Google Reader and saw some more blogs. I came across Barack and Michelle’s first dance as President and First Lady, boppin’ to the beat of Etta James’ classic “At Last,” sang by a more restrained than usual (but still fabulous) Beyonce. I might just be sitting in the study room on campus in Tokyo, JPN with my earbuds in, volume turned down low, but I was cheesing the whole way through. Right at the end, when Michelle threw her arms around her husband’s neck, I got that tingly, stingy feeling in my eyes like MAYBE I could have dropped a tear. I’ll take it. 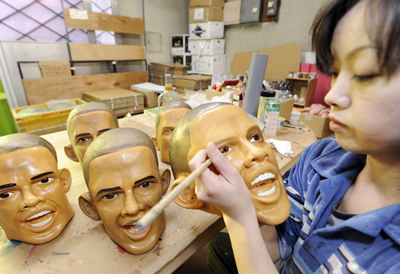 Swiped from SheenaSays (who swiped from HuffPost), check out these Obama masks being manufactured in JPN. I should stock up on these babies while I’m here, pack a suitcase full and bring ’em back to the US, selling ’em for a profit in 2012! The Ogawa Rubber Inc factory, north of Tokyo, said it had produced and sold more than 2,500 Obama face masks since December, and 1,000 more are being manufactured, making it their fastest selling product. “I believe that unlike Japanese politicians’ masks, Obama’s mask radiates something that grabs people’s hearts. I think many people do feel that energy,” said executive director Takahiro Yagihara. The mask is sold for some 2,200 yen ($24) at toy and costume shops across Japan. I’m kind of bummed that I’m not going to be able to hang out with EVERYone at the inauguration in DC this week. I keep seeing all kinds of talk about the events so far this past weekend and the events to come all on Twitter and via all the blogs that I check out. True, I’m over here in Tokyo and you’re probably thinking I have a million other things to do, but really, who wouldn’t want to be in DC right now? Ok, probably people who live in DC but you know what I mean. Election night, when the results came in, we were already talking about being in DC. The next day, hotels were already booked solid and people were scamming on tickets. Truthfully, I don’t think I’ve ever even known when an inauguration was taking place, let alone tried to plan to attend one! This is clearly a major historical event and who wouldn’t want to say “I was there when…” twenty years from now? I was thinking it’d be cool to spend the day in Obama, Japan but that’s hours away from Tokyo. Sike. There’s an event going on in Shibuya with a group of folks meeting up to watch a recorded version of the President’s speech, but I’ll be in class at that time (skip day?). Thankfully, you all keep me informed with your blogs and tweets so I’m sure I’ll get the entire rundown even before I want it (you should see how hard it is to NOT hear about sports scores or tv plots before we get a chance to watch it over here!). I hope you all have a great time and, most of all, keep it classy. I was so happy with the way things went down on Election Day. I hope that we can carry over that same sense of pride and celebration without turning the event into Freaknik ’09, knowwhati’msayin?